Nels Coxman (Liam Neeson) is Kehoe, Colorado's most reliable snowplow driver. He was recently named the popular ski resort area's “Citizen of the Year” for keeping its treacherous mountain roads clear during the blizzards which routinely threaten to disrupt the town's tourist season. Not used to making public appearances before an audience, the shy civil servant needs some help from his wife (Laura Dern) dressing and preparing an acceptance speech. Unfortunately, tragedy strikes the night of the awards dinner when their son (Micheál Richardson) dies of a drug overdose in nearby Denver. After identifying the body at the morgue, Grace (“We didn't know our own son.”) is inclined to accept the police explanation that Kyle had been a heroin addict. But hubby Nels (“Kyle wasn't a druggie!”) is very skeptical, since the kid had no history of drug use and had been gainfully employed as a baggage handler at Kehoe's airport at the time of his demise. So, the grieving dad decides to do a little digging on his own and soon discovers that Dante (Wesley MacInnes), a co-worker of Kyle's, had stolen a kilo of cocaine from a drug cartel. As it turns out, Kyle was ostensibly murdered in a case of mistaken identity on orders from a kingpin known as Viking (Tom Bateman). That's little consolation to Nels who suddenly becomes blinded by rage. The mild-mannered pillar of the community morphs into a sadistic spree killer determined to track down the powerful mobster who ordered the hit on his boy. However, Viking has an army of minions running interference, which means Nels must negotiate a perilous gauntlet en route to his well-protected target. Thus unfolds Cold Pursuit, a riveting vigilante thriller directed by Hans Petter Moland. The movie is a faithful, English-language adaptation of In Order of Disappearance, a gratuitous gorefest which Moland made in his native Norway in 2014. This equally-gruesome remake similarly veers back and forth between slaughter and slapstick, never fully committing to comedy or drama. 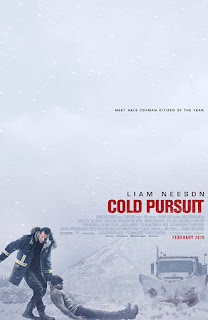 Whether we're supposed to laugh at or recoil from the escalating body count, Cold Pursuit, at heart, is a wanton splatterflick certain to satiate the bloodlust of fans of the genre.